Answering the Burning Question on Venezuelan Minds: To Stay or to Leave? “Heartbroken doesn’t even begin to explain it. I live in Berlin, but my country's situation disrupts my little bubble of comfort here in the first world. ” Image made by Venezuelan graphic artist Leonardo González, used with permission. Venezuela currently faces the highest rate of inflation  in the world, along with chronic food and medicinal shortages. While the government and the opposition continue to blame each other for the dire state of the economy, Venezuelans living abroad have been reaching out to Venezuelans in the country, through social media, to say that there is a world outside their crisis-ridden country. […] Los momentos de migración en Venezuela en los últimos 15 años pueden ser divididos en tres períodos. En el primero, fue la élite venezolana la que emigró entre 1999 y 2003 debido a los cambios de carácter político que trajo la llegada del presidente Hugo Chávez […] En el segundo, comprendido entre 2004 y 2009, fueron los talentos y saberes los que abandonaron el país. Ahora, desde 2010 hasta la actualidad, los jóvenes y la clase media son quienes se despiden en [el aeropuerto internacional de] Maiquetía [debido a] las condiciones políticas, sociales y económicas de Venezuela. Migration in Venezuela can be divided in three phases: The first was the migration of the elites, that left the country between 1999 and 2003 due to the political changes that were brought by the arrival of president Hugo Chavez […] The second, between 2004 and 2009 were qualified and educated people. Now, since 2010, it is the younger generations and the middle class the ones saying good-bye at the International airport in Maiquetía [due to] Venezuela's the political, social and economic conditions. My heart is full of lead, weighed down by an inability to put Venezuela behind me. Every day, this scene repeats itself five, six times. Whether it is in a work meeting, a comment by a student in the hallway, or a call from a friend, people’s questions are always the same: “how horrible, what is going to happen?” The other day I started talking to a panhandler. He asked me where I was from. “Venezuela? Sheesh, things there are baaaad…” He gives me his pity look. My reaction is the same. When I talk about it, it’s the half-an-hour of lingering emotional [hangover] that gets me. I am grateful people are concerned, but I can’t help feel a bit jealous. They go on with their lives. They don’t feel guilty every time they go to the supermarket. They don’t have to spend hundreds of thousands of pesos buying medicine for loved ones to send home. 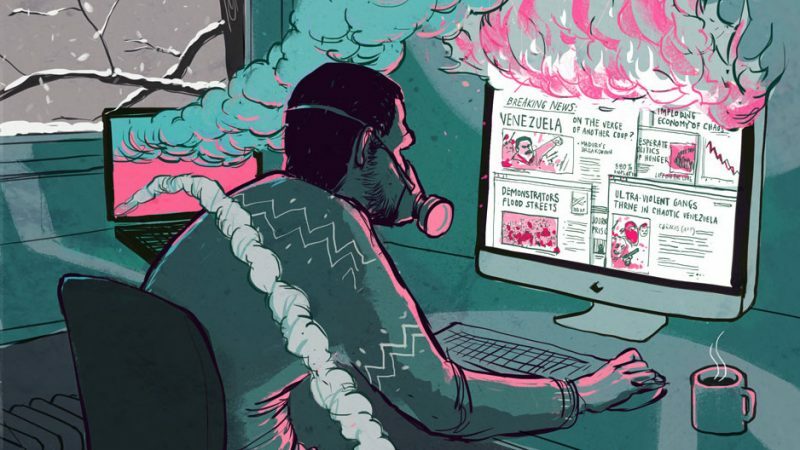 They don’t spend hours and hours away from their family writing about Venezuela’s crisis. We’re lucky. We’re not living through this crisis directly. But in a tiny way, we are. We’re keeping informed, but not really in touch. We’re being entertained, but not really fulfilled. My family is now split across continents, leaving group chats and video calls as our only tools for maintaining our meaningful connection. I appreciate these feeble bridges that digital technology is tending, but, having lived the real deal, they don’t fully cut it. We are away because the crisis became too dire, opportunities sprung up elsewhere, and we took them. We were extremely lucky to be born to this loving family and to not have been victims of the real tragedies happening to Venezuelans every day. Alas, the crisis turned my family to a virtual one, and it hurts. Pienso que hay que desechar esa tontería de sentirse orgulloso del país en donde uno nació sólo por eso. O sentir orgullo por los logros de connacionales excepcionales que se destacan alrededor del mundo en las distintas disciplinas. Si más bien dichos logros es porque se desprendieron de esa prisión moral y social que es atarse a una nacionalidad y actuar acorde a ella y a sus expectativas. No es casualidad que los grandes escritores o pensadores venezolanos cargaran sus obras con tanta crítica social hacia la identidad nacional, porque muchas veces los logros no son por el gentilicio sino a pesar de él. I think we should discard the idea of being proud of the country we were born just for being born there, or being proud of the achievements of exceptional countrymen/women that shine around the world in different disciplines. Those achievements have taken place because they let go of that social and moral prison that is to be attached to a nationality and act according to it and its expectations. It's not a coincidence that great Venezuelan writers or thinkers charged their work with so much social criticism to national identity. Often times we achieve something despite our nationality rather than because of it. Uno siempre piensa que su país es el mejor, que su cultura es la mejor, la verdad es que todas las culturas son muy bonitas. No somos de ninguna parte, sino que somos del mundo. La gente tiene que atreverse, a viajar. Yo pienso que la vida es conocer, ir a otros lados, conocer otras personas, conocer otras culturas. Ver el mundo. We always think our country is the best, our culture is the best, and what's true is that all cultures are beautiful. We're not from one place, we're from the world. People need to dare, to travel. I think life is about knowing, going places, meeting people, encountering cultures, see the world.